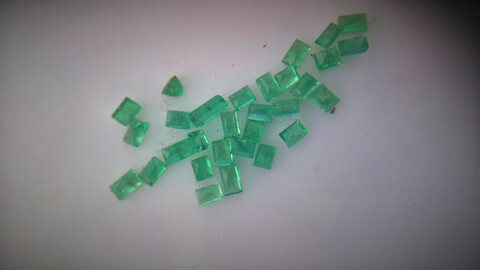 Emeralds and aquamarines are color varieties of the mineral Beryl. Emeralds have been accepted as gems for over 4000 years. The name emerald comes from the Greek smaragdos meaning "green stone" and probably referred, in fact, not just to emeralds but to all or many green gems. It's common knoweledge in the trade that most emeralds are treated, Some are filled with oils, such as cedarwood. Others are filled with polymer resins to hide surface-reaching breaks and improve transparency. As with most treatments there's nothing wrong with this as long as the buyer knows that the stone they are buying is treated. In 1963, Jules Sauer, a noted Brazilian gem dealer, found beryls in Salininha in Brazil's Bahia State. For more than a century, the gem world had defined "emerald" as green beryl, colored by chromium, The Bahia emerald were colored by both vanadium and chromium but mostly by vanadium. In an effort to expand the emerald defination to include his discovery, Sauer submitted his stones to GIA Gem Laboratory. Because the GIA lab bases the emerald variety designation on color rather than the elements causing the color, it recognized Sauer's stones as emerald. This not only opened up new emerald sources in Brazil, but also in Africa, which had large deposits of emerald colored primarily by vanadium. A few gem dealers still refuse to accept beryl colored primarily by vanadium. There's also persistent questioning in the trade about how green beryl must be before it's calssified as emerald. Add to these issues the degree of physical danger modern emerald miners and marketers face, and you can see how the gem's legacy of violence and controversy is almost as eternal as the stone itself. Emerald boasts a great deal of folklore. It was used as a burnt offering, a symbol of St. John, and supposedly was a poison antidote, a cure for fevers and epilepsy, eye relief (due to the exceptional color), a cure for dysentery and leprosy, a cure for ophthalmia and bleeding, a cure for stomach problems (when laid on the stomach), and a good laxative. For Taurus wearing an emerald will insure loyalty, and improve memory. The birthstone for May, emearld is steeped in superstition and lore. It is the symbol for immortality and the symbolisation of faith.